Isom Sowell deeded James Dowdy 9 acres located on Locust Branch adjoining Stephen Davis and Jesse Ritter. John Dowdy and Thomas Dowdy were witnesses. Ordered that John Richardson be appointed overseer in place of Stephen Davis. Estate of Joice Muse, Dec'd. by Administrator Brinkley Phillips. Notes due on the following: John B. Kelly and Jesse F. Muse. Items were purchased by the following: Kenneth McCaskill, Jesse Sanders, George Cox, James Hill, Eleazor Burkhead, Danl. H. Muse, Thomas Muse Senr., Martin Hill, Alexr. McIntosh, Danl. Muse [SP], Alex. C. Curry, James Dowd, Jane Muse, John T. Ritter, Jesse Page, John Paterson, Nathan Holloway, John Tyson, Isaac Smith, Nathan Barrett, Stephen Davis, Lauchlin McNeill, Alexander Campbell and John Moore. Ordered that Jesse Sanders and Eleazor Birckhead Esqs. be appointed to examine Nancy McIver, wife of Daniel McIver and Margaret Garner, wife of James Garner to confirm their voluntary consent in a deed to Stephen Davis. Ordered that John McLeod be appointed guardian to Elizabeth McLeod and Ann McLeod, infant heirs of Neill McLeod, Dec'd. with securities Stephen Davis, Angus McKinnon, William Hancock and Neill Morison. Lewis Lawhon received 16 acres located on Richland Creek adjoining Joel Lawhon, John Tyson, Dempsy Sowell, Quimby Sowell and Stephen Davis. Quimby Sowell and Burrel Ritter were chain carriers. James Dowdy Sr. deeded James Dowdy Jr. tracts  41 acres located on Locust Branch being part of Donald McQueen's 100 acre grant  9 acres adjoining Stephen Davis and Jesse Ritter. Artemus Shattuck was a witness. Stephen Davis received 50 acres located north of Richland Creek northeast of Locust Branch adjoining William Caddell, Lawhon, Cornelius Black and own line. William Caddell and Cornelius Black were chain carriers. Mary McIntosh v. John J. McIntosh and others. The following appointed to lay off dower for Mary McIntosh of 201 acres from land of Neill McIntosh: Stephen Davis, Jesse Bean, Hardy Warner, Briant Dowd, Neill Caddell, Madison Fry, Alexander T. Muse, William Caddell, Thomas Hannon, John W. Warner, Daniel H. Muse and Jesse Hannon. Ordered that Angus McCaskill be appointed overseer of the road from the mouth of Kelly's lane to the bridge on Richland Creek and work the following hands: Stephen Davis hands, Joseph Smith, Eli Oldham, Michael Cockman, Alvin Smith and Eli Danielly. Ordered that Presley Caddell be appointed overseer of the road from McQueen's Branch to the Richland Creek Bridge and work the following hands: George McIntosh, Joseph Caddell, Quimby Sowell, Duncan McIntosh, Jesse Muse, William L. Wallace, Duncan Black, William Sowell, Richson Fry, Neill Black, William Richardson, David McIntosh, Henry Muse, Elias Brewer, J. McIlwennin and Stephen Davis' hands. Duncan M. Kennedy and John J. McIntosh v. Stephen Davis and others. Petition for partition of real estate. Appearing that Devotion Davis [and other heirs of Edmond Davis] are non-residents of the state. They are summoned to appear at the courthouse in Carthage on the fourth Monday in October. Stephen Davis received 20 acres located east of Richland Creek adjoining the heirs of Davis, heirs of Joel Lawhon and Dowdy. Edmund Davis and Josiah Lawhon were chain carriers. Stephen Davis received 4.20 acres located northwest of Richland Creek adjoining his own line and widow Lawhon. John Davis and Edmund C. Davis were chain carriers. Stephen Davis received 18 acres located northwest of Richland Creek adjoining his own line, Moore, Worth and Lawhon. John Davis and Edmund C. Davis were chain carriers. Ordered that Joseph Caddell be appointed overseer of the road from the mouth of Kelly's Lane to McQueens Branch and work the following hands: William R. Muse, William R. Sowell, Presly Caddell, Angus McCaskill, Stephen Davis hands, Alvin Smith, Eli Danielly, Kinneth McCaskill, Cornelius D. Smith, Quimby Sowell, Duncan McIntosh, Neill Black and Daniel McIntosh. Ordered that Daniel McIntosh be appointed overseer of the road from the mouth of Kellys Lane to the McQueen Branch and have the following hands to work: Joseph Caddell, William R. Muse, William Sowell, Presley Caddell, Angus McCaskill, Stephen Davis hands, Alvin Smith, Eli Dannelly, Kenneth McCaskill, Cornelius D. Smith, Quimby Sowell, Duncan McIntosh, Neill Black, Quimby Sowell Jr., Noah H. Muse and George Williams. Devotion Davis is appointed administrator of Stephen Davis Dec'd.with Samuel C. Bruce and Alexander Kelly as securities. Ordered that Devotion Davis be appointed guardian of Mary Ann Davis, William H. Davis, Malcolm P. Davis and Stephen Davis, minor heirs of Stephen Davis, Dec'd. Nancy Davis v. Devotion Davis and others. Ordered to distribute estate of Stephen Davis Dec'd. between Nancy C. Davis, John M. Davis, Mary Ann Davis, Harrison Davis, Malcolm Davis, Stephen Davis and Devotion Davis. Jesse Bean, William Moore, John A. Jackson and W.R. Sowell appointed to lay off and divide lands of Stephen Davis Dec'd. [Lot 7] Nancy Davis 55 acres east of Richland Creek [Lot 6] John M. Davis 55 acres east of Richland Creek adjoining William Moore and Richardson [Lot 1-5] Devotion Davis, Mary Ann Davis, William H. Davis, Malcom Davis and Stephen Davis 195 acres both sides of Richland Creek adjoining Lawhon, William Caddell, William R. Sowell. Jesse Bean received 6 acres located south of Richland Creek adjoining heirs of Neill McIntosh, heirs of Stephen Davis, his own line and James Dowdy. John J. McIntosh and A.W. Bean were chain carriers. [S118] Company H 26th Regiment, Moore County Independents [www.companyh26th.com], Lacy Garner [lacyjoe@centurylink.net]. Stephen Davis was born in Moore County 05 May 1846, the youngest son of Stephen Davis, Sr. (born abt. 1793) and Jane "Jennie" Muse (1795-1867). This Davis family was renowned stone cutters, quarrying mill stones and such from down on Richland and McLendon Creek. They lived on present day J. Dowdy Road, at the more recent Jesse Dowdy home place. Across the highway an unfinished rock wall partially surrounding the Davis Family Cemetery serves as a reminder of their ability to cut and maneuver massive blocks of stone. It's not that they lacked the skills to complete the job but simply that they ran out of time. This world runs on a tight schedule and sometimes a lifetime is just not enough time. So much of our labors are often left unfinished. Stephen Davis, Sr. seems to have been a son of Hardy Davis (died before 1815) of upper Moore and southern Randolph County, North Carolina. Other suspected children of Hardy Davis include Margaret "Peggy" Davis (~1795-1867) who married James "Big Jim" Garner (~1792-1882) and George Davis (~1802-1867) who married Elizabeth Davis (b. ~1800). Margaret "Peggy" Davis Garner is buried in this Davis Family Cemetery. We know this because a grandson, James Douglas "Doug" Garner (1855-1935), told his son Little John Garner (1896-1987) that he attended his grandmother's funeral and her burial in the Davis Family Cemetery as a young boy. The dates verify his story because Doug Garner would have been twelve years old when Peggy died in 1867. The Civil War interrupted many a hard working family and the Stephen Davis family was no exception. 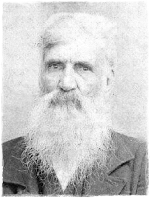 Brothers Devotion and William Henry H. Davis enlisted as soon as the conflict began. They both volunteered for service in Moore County's Company H, 26th Regiment. They called themselves the "Moore Independents". Devotion was discharged early for unknown reasons while William Henry was promoted to Sergeant in April, 1862 and died in the hospital at Petersburg, Virginia on 30 July 1862. Stephen was the youngest of the Davis brothers and had to wait until he turned 18 to join, which would have been around 1863 or 1864. By that time Confederate record keeping had gotten so haphazard that no records documenting when he actually joined are available. Records were found confirming that he was indeed a soldier in Moore County's Company D, 49th Regiment. He was captured at Petersburg, Virginia 01 Apr 1865 and released on 12 Jun 1865 from Point Lookout, Maryland after taking the Oath of Allegiance. The war was finally over.